Call (770) 623-0515 for more information! Whether you’re looking for event rentals for a corporate party, tent rental products for a wedding reception, or concessions for your child’s birthday party, we’re the party rental company you can count on. Along with our superior rental products, we have a team of friendly and knowledgeable event planners with more than 30 years of combined experience. These event planners can help our customers figure out exactly which rental products will be best for their specific event and how many of each they’ll need to accommodate their guests. At Atlanta Event Rental, we take tremendous pride in being a full-service event rental company that doesn’t rest until our customers are completely satisfied. 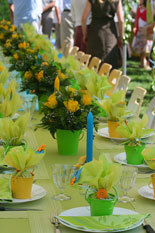 For more information about our party rental products, please call or e-mail us today. We serve customers throughout the Atlanta area, including Johns Creek, Marietta, Alpharetta, Norcross, and many other surrounding communities.